Bath Fire Department firefighters toss out burned bedding after responding to a fire Thursday at the Lima Inn at 1201 Neubrecht Road. The fire was in the rear and is considered suspicious. 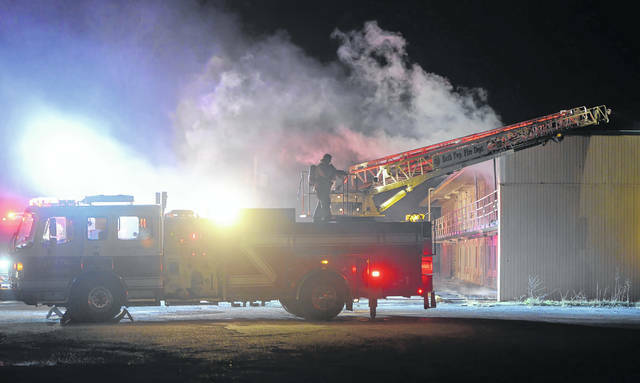 BATH TOWNSHIP — In what is becoming an all-too-frequent occurrence for Bath Township Fire Department personnel, firefighters responded Thursday evening to a fire at the site of the former Lima Inn motel. The motel, located at 1201 Neubrecht Road, has been closed for about two years. 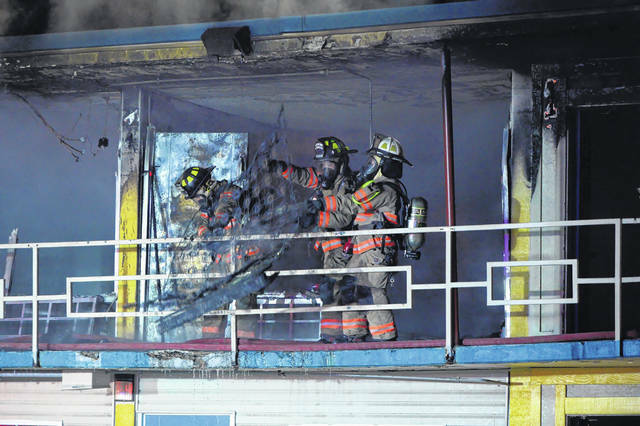 Upon arrival, firefighters observed heavy smoke and flames coming from two of the motel rooms at the rear of the building. The rooms involved suffered heat, smoke and water damage. It took firefighters about 1 1/2 hours to fully extinguish the fire, which was reported by a passerby. The property is owned by 1201 Neubrecht Road Property LLC of Mentor. Fire department officials have been unable to contact the owners but have confirmed that the property is uninsured. Firefighters have responded to fires at the location on several previous occasions in the past year. Bath Township Fire Department officials have been working with the State Fire Marshal’s Office Investigative Bureau and the Blue Ribbon Arson Commission. The cause of the latest fire is undetermined and is considered to be suspicious, according to Fire Chief Joseph Kitchen.